MATCO mfg produces the WHLNW50CC.75R inch nosewheel for use with aircraft requiring less than 1185 pounds nosewheel load. The WHLNW50CC.75R uses .75 inch TAPER/ROLL bearings. It is 3.70 wide and weighs approximately 2.7 lbs. 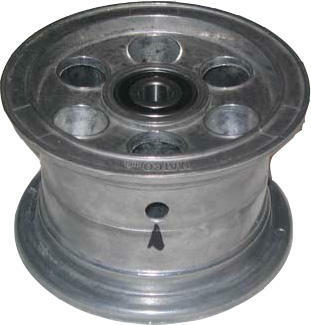 This wheel is designed with 11x400x5 'Lamb' type tires. (Specify the NW51CC.75R for use with 5.00-5 aircraft style tires).